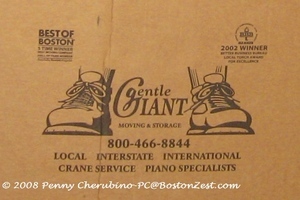 Sunday's Boston Globe Magazine had an article about Gentle Giant Movers and the Olympic class rowers they employ. Today Gentle Giant is moving our neighbors. Having them next door reminded me of just how good they are at what they do. I'm hearing the rip of tape as they seal blankets around items and build boxes for packing. I'm not hearing things crash or bump into walls. I'm not hearing the movers yelling to one another, or using loud speaker phones or radios to communicate. These are common problems experienced when other companies are working in our building. When I've had to go in or out by them, they've been unfailingly polite and quickly moved things out of my way. Gentle Giant seems to have a corporate culture of good manners, respect for neighbors, buildings, and customers. I've used them for two very difficult moves with a family member. The first was when she moved from a large home to a small assisted living apartment. They had to set up the move to take certain items to storage, others to her new home and leave many things in place to stage the old house for sale or donate to charity. It was surely not your typical move, and the giants handled it well. A few years later, they moved her within the assisted living complex, to a locked dementia unit. That required them to move her things into that area and not allow any residents of the unit to leave while the door was open. The young men from Gentle Giant did this with patience and humor. Today they have a separate website for this type of service. I highly recommend turning to them should you find yourself faced with assisting a senior family member with a move. If you're planning a move of your own, visit their main website. They have excellent information that will get you off on the right track. Check out their "Pack Like the Pros" videos. Here's a link to the Globe Magazine article mentioned above.